^ 堀内 2015, pp. 80-89. ^ Kiple & Ornelas 2004, pp. 519-520. ^ a b マーヴィン・ハリス『食と文化の謎：Good to eatの人類学』 岩波書店 1988年、ISBN 4000026550 p.93. ^ Kiple & Ornelas 2004, p. 526. ^ Bernstein, William J. (2009). A Splendid Exchange: How Trade Shaped the World. p. 56. ISBN 9780802144164. ^ Farah, K. O.; Nyariki, D. M.; Ngugi, R. K.; Noor, I. M.; Guliye, A. Y. (2004). 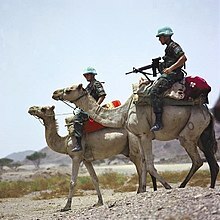 “The Somali and the Camel: Ecology, Management and Economics”. Anthropologist 6 (1): 45–55. オリジナルの2016-03-04時点によるアーカイブ。. http://web.archive.org/web/20160304194526/http://www.mbali.info/doc265.htm. "Somali pastoralists are a camel community...There is no other community in the world where the camel plays such a pivotal role in the local economy and culture as in the Somali community. According to the UN Food and Agriculture Organization (FAO, 1979) estimates, there are approximately 15 million dromedary camels in the world"
^ a b Dolby, Karen (2010-08-10). You Must Remember This: Easy Tricks & Proven Tips to Never Forget Anything, Ever Again. Random House Digital, Inc. p. 170. ISBN 9780307716255. ^ Kiple & Ornelas 2004, pp. 518-519. ^ Saalfeld, W.K. ; Edwards, GP (2008). “Ecology of feral camels in Australia” (DKCRC Report 47). Managing the impacts of feral camels in Australia: a new way of doing business. Alice Springs: Desert Knowledge Cooperative Research Centre. ISBN 1741580943. ISSN 18326684. http://www.desertknowledgecrc.com.au/resource/DKCRC-Report-47-Managing-the-impacts-of-feral-camels-in-Australia_A-new-way-of-doing-business.pdf. ^ Pople, A.R. ; McLeod, S.R.. “Demography of Australian feral camels in Central Australia and its relevance to population control”. The Rangeland Journal 32: 11–19. doi:10.1071/RJ09053. http://www.publish.csiro.au/paper/RJ09053 2011年6月6日閲覧。. ^ a b c d フェイガン 2016, pp. 225-243. ^ 堀内 1992, pp. 58-59. ^ 堀内 2015, pp. 110-111.